This December 1st through December 8th we will have our giant Special Christmas Sale at the W.T. Bland Library. The sale will be open during regular library hours. 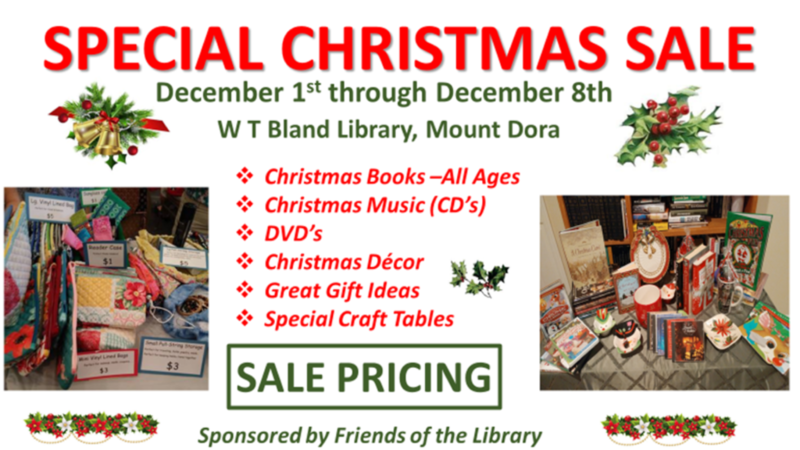 Come in and check out our large selection of Christmas books, wonderful Christmas inspired music CDs and the best of the season’s movies on DVDs. We also have a large selection of gorgeous Christmas decor and crafts. Whether you are looking for something special for yourself or searching for the perfect gift for a friend or family member you can find it at our sale. We even have items for the little ones! Happy Holidays from all of us at the Friends of the Library.